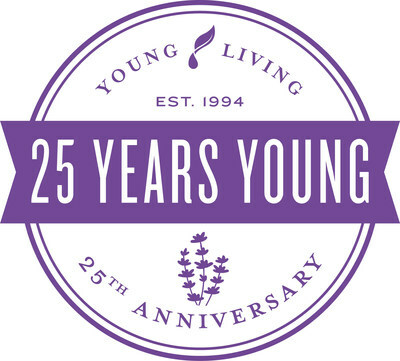 LEHI, Utah, April 1, 2019 /PRNewswire/ — Young Living Essential Oils, celebrates 25 years as the world leader in essential oils today. As pioneers in the field and the first essential oil enterprise to turn 25, the company is going a step beyond honoring their past; Young Living is eagerly looking toward the future. Since 1994 Young Living has shipped products to over 200 countries, formulated over 600 health and wellness products, offered the largest range of essential oil products on the market and employed nearly 4,000 global employees. Moving forward, Young Living is ready to fulfill their ambitious 5x 5 Pledge to open at least 25 new global markets, achieve zero waste in all of its global facilities, develop at least twenty five Corporate-owned or Partner Farms, reach five million additional households and impact five times more children through The D. Gary Young, Young Living Foundation all over the next five years. “It’s clear that Young Living stands apart in the essential oil industry,” notes Jared Turner, Young Living President and COO. “Our success isn’t defined by any single thing, but rather our commitment to the lifestyle of nontoxic and whole life wellness, our ability to empower families around the world with the development of their entrepreneurial mindsets, and our continued efforts to give back to underserved communities. We will continue to work tirelessly to fulfill the mission established by our founder D. Gary Young, to bring the highest-quality essential oils to every home in the world.” Consumers can always buy with confidence knowing that through Young Living’s Seed to Seal® quality commitment—an unmatched, unparalleled benchmark that produces authentic and potent essential oils, quality will never be compromised. Mary Young, Co-Founder and CEO, says, “We’re tremendously excited to move forward with imagination and creativity, to stay focused on our goals that will shape the next 25 years, and to express positive determination as we help each other achieve our highest potential.” Building on its 6-million-member customer base with millions more Young Living each year, the company’s influence and global impact will continue to change the world! Young Living Essential Oils, LC, based in Lehi, Utah, is the world leader in essential oils, offering the highest quality oil-infused products available. Young Living takes its industry leadership seriously, setting the standard with its proprietary Seed to Seal® quality commitment, which involves three critical pillars: Sourcing, Science, and Standards. These guiding principles help Young Living protect the planet and provide pure, authentic products that its members can feel confident about using and sharing with friends and family. Young Living’s products—which all come from corporate-owned farms, partner farms, and Seed to Seal-certified suppliers—not only support a healthy lifestyle but also provide opportunities for over 6 million global members to find a sense of purpose and whole-life wellness by aligning their work with their values and passions. For more information, visit YoungLiving.com, follow @younglivingeo on Twitter, or like us on Facebook. UAE Ambassador visits blind children’s hospital in Kazakhstan.